Have you ever dreamed of staying in those gorgeous overwater bungalows in Bora Bora? This 12-day itinerary will bring you the best overwater bungalow experience, and so much more, on the exotic tropical islands of Bora Bora, Rangiroa, and Moorea. 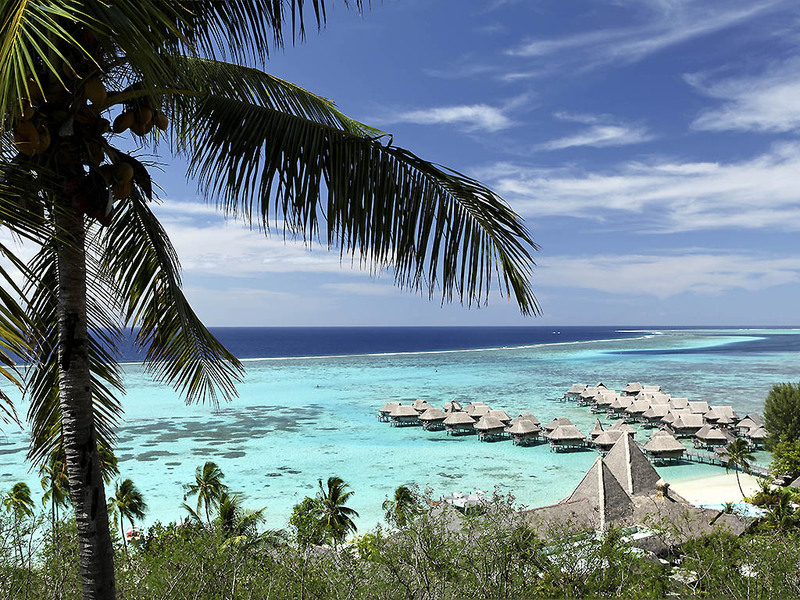 EasyTahiti.com prepared this custom Tahiti getaway package that includes superior resort experiences in luxurious overwater bungalows, meals at the resorts, island excursions and air transport from island to island. This is the alternative land itinerary to our 11-Day Tahiti Cruise vacation. This captivating video will have you yearning to put this dream trip on your bucket list. This itinerary for two has already been tested by two of our SomedayTrip contributors and they confirmed that it was an awesome 12 days in Tahiti. The first stop is the island of Tahiti which is the largest island in French Polynesia, where the capital city of Papeete is located and where all international flights arrive. This is where all vacations begin and end in the islands of Tahiti, also known as French Polynesia. Before jetting off to the other islands, Tahiti has much to offer with its vibrant city of Papeete that has a bustling harbor, a downtown market with a variety of Tahitian goods and waterfront promenade with gourmet food trucks serving French crepes, steak frites, pizza and so much more. Beyond the city, there are beautiful beaches with calm water and lush landscapes with gorgeous waterfalls. There are plenty of watersports activities available here as well. Here, the itinerary includes 3 nights at the Intercontinental Tahiti Resort in a Panoramic Lagoon View Room with daily breakfast and dinners included. This is Tahiti's sister island, appreciated for its luxuriant landscape, tropical gardens, pineapple plantations and turquoise blue lagoon. Here we will stay 3 nights at the Sofitel Moorea Ia Ora Beach Resort in an elegant and spacious Luxury Overwater Bungalow with daily breakfast included plus a free full day lagoon tour for two by boat with picnic on a motu (white sand islet). The Sofitel Ia Ora is a 4-star hotel located on the island's most beautiful beach. The white sand beach offers magnificent views of the lagoon with the island of Tahiti in the background. There is is snorkeling near the hotel and snorkel equipment and Tahitian canoes available to hotel guests at no extra cost. The hotel has a lovely restaurant called the K Restaurant that is described as beachy, elegant and romantic at the same time, with its white sand floors. Every night you can enjoy dinner by candle light and watch a Tahitian dance show. The "Pearl of the Pacific", known for the splendor of its lagoon, where the overwater bungalows experience is a must. This is where we will stay for 3 nights at the Intercontinental Bora Bora Resort & Thalasso Spa in a Sapphire Overwater Junior Suite Villa with daily breakfast and dinner included. Also included is one breakfast for two delivered by Tahitian canoe to the deck of our Overwater Bungalow. This resort is one of the top 3 five-star resorts on Bora Bora and is located on a private island called a 'motu', accessible by boat only. It has some of the largest overwater bungalows on the island, the best spa in French Polynesia, first-class service, and incredibly romantic sunet views of Mount Otemanu. The resort offers bungalows with floor to ceiling windows in front of each king size bed, perfectly designed to admire the lagoon as you're waking up. Each bungalow (or villa) is also equipped with a glass bottom table to observe the marine life underneath. There is direct access to the lagoon right from your private deck. Unlike the other 5-star resorts located on 'motus', you have the option of taking free shuttle boats to the main island giving you more dining options and excursion opportunities. They've recently opened a new gourmet restaurant Le Corail. This island is described by our easyTahiti.com personal travel consultant as a whole other world where you'll feel like you jumped into a postcard. Both coral atolls are located in the Tuamutu archipelago and offer the best possible snorkeling experience in French Polynesia and the most impressive unobstructed views of its bright blue lagoons. There's a very good chance you'll see wild dolphins in Rangiroa. Also, the diving experience here is world class. We plan to stay 3 nights at the Hotel Kia Ora Rangiroa in a Pool Villa including daily breakfast and dinner. This 4-star resort is located on the northwest part of the atoll of Rangiroa, between the passes of Tiputa and Avatoru. Nestled in the heart of a coconut plantation, bordered by a white sand beach and a turquoise lagoon, the only resort on Rangiroa wth a nice beach, this resort is the best in terms of luxury resorts in the whole Tuamotu archipelago. The additional perks included in this package deal are a traditional welcoming with flower necklaces, all inter island flights, all taxes, except city taxes, and all round-trip transfers from airports to our selected hotels. There are numerous excursions available to visitors on these islands to experience all the beauty these islands have to offer. Your travel consultant can provide the full list with recommendations based on your interests. We worked with one of easyTahiti.com's personal travel consultants to arrange this itinerary as we were originally going to do this land-based travel plan in Tahiti, however, the cruise option was what we decided would better suit our interests. It was a difficult choice between the two options, and that's why we highly recommend this package as well for those who want more of a resort and bungalow experience rather than a cruise around these islands. We were very pleased with our communications with easyTahiti.com as they were extremely helpful, very informative, ever friendly, and always answered our questions promptly. They were recommended by two of our SomedayTrip contributors who had worked with them to plan their trip to Tahiti and were very satisfied with their trip. They are located in Tahiti (Downtown Papeete), so they are reachable and at your service throughout your stay in French Polynesia and ready to provide you with the assistance you might require. They offer a "easyConcierge" service, available 24/7 should a problem occur. As a travel agency, their travel consultants work with their customers on a personal basis taking all their preferences and criteria into account when booking their dream vacation. Traveling to French Polynesia (Tahiti) is a big bucket list trip for many of us, so we would recommend working with this travel service to make the planning phase easier. Bon Voyage!